Looking for the best Chicken Florentine recipe? Try mine—it calls on Comté cheese for extra richness of flavor and a touch of curry for intrigue. But first, a little story about a good buddy of mine who also loves this particular chicken florentine recipe. 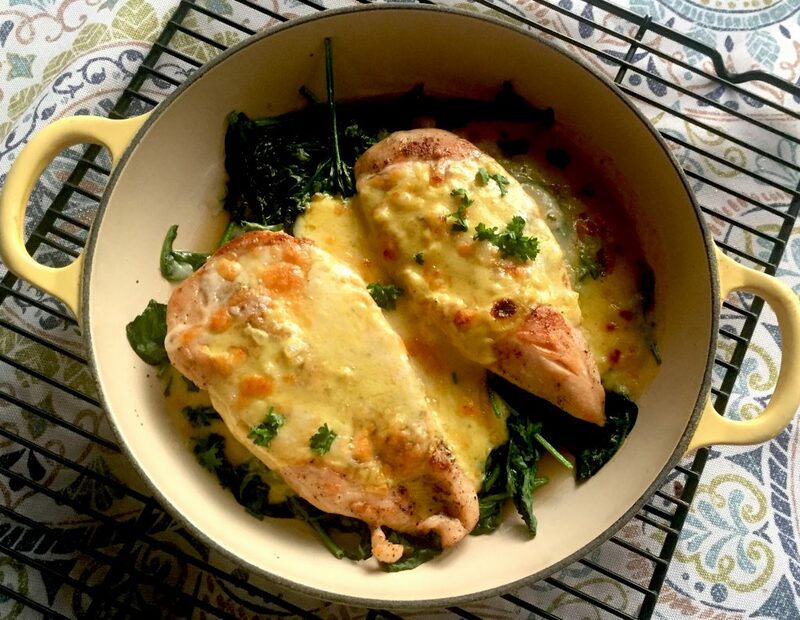 Chicken Florentine recipe with Comté and a touch of curry. When traveling in the Comté region of France, I noticed chefs often combined a bit of curry in recipes with the regions famed Comté cheese. I followed suit for this easy Chicken Florentine recipe, and the results are divine. One of my favorite memories from college is of a casual dinner club a group of pals put together in our senior year. Every Sunday night, one of us would host a dinner we’d all share, before going our separate ways to study. It was never a party night—in fact, we never drank at these events at all. It was simply a way to nourish each other before we hunkered down for the coming week of classes. 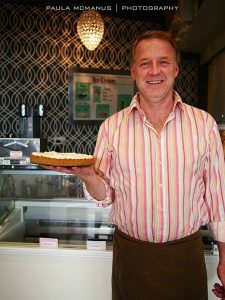 My friend Doug, who now lives in Adelaide, Australia, and is co-owner of the Yankee Cafe. Photo credit. When you’ve had a steady diet of cheap pasta, hamburger and legumes, then something as opulent as a beef tenderloin comes along, it’s not something you forget too soon. Plus, Doug was not only a generous person, he was also an excellent cook before being a great home cook was cool. The first time I ever tasted beurre blanc was not in France, but in his Seattle apartment, where he moved in his 20s. He now owns a restaurant in Adelaide, Australia, with his life-partner Steve. Their place is called the Yankee Cafe. Doug is, of course, the Yankee and the cook; Australian-born Steve runs the front of the house. If you ever get to that part of the world, stop by. I sure hope to do so someday myself. What does that little memory have to do with my Chicken Comté Florentine? It’s all about Doug. When I published “The Bonne Femme Cookbook: Simple, Splendid Food That French Women Cook Every Day,” Doug was first in line to buy it, cook something from it, and write me with enthusiasm about it. He especially liked the recipe below, and told me that he cooked it for an intimate dinner party, where it was a great hit. So, take it from a guy who served an unforgettable beef tenderloin out of the tiny kitchen in his studenty and beat little apartment in Iowa City, Iowa, in 1981. This recipe is a good one. While I love Comté, you can use any cheese you like, as long as it grates and melts well. Place chicken breasts, one at a time, between two sheets of plastic wrap and pound until ¼ inch thick. (Or slice chicken breasts in horizontally into two thin scallops, or butterfly if small.) Season both sides with salt and pepper. In a large skillet, melt 1 tablespoon of the butter over medium-high heat. Add chicken and cook for 6 to 8 minutes, or until no longer pink inside, turning once. Transfer to a platter and cover with foil to keep warm. For sauce, in a small saucepan, cook and stir shallots in the remaining 1 tablespoon butter until tender but not brown. Add flour and curry powder; cook and stir briefly to form a paste. Slowly add milk, whisking with a wire whisk until combined. Bring to boiling; cook and stir until the mixture boils and thickens; cook and stir two minutes more. Stir in ½ cup of the cheese until melted. Remove from heat and set aside. Heat 1 tablespoon olive oil in a large skillet. Add spinach, cooking and turning just until wilted (you may need to do this in two batches). Do not overcook—a few remaining unwilted leaves is fine. Transfer spinach to a shallow flameproof baking dish. Top with the cooked chicken breasts. Top with sauce and sprinkle with remaining ¼ cup cheese. Broil for 4 to 6 minutes or until cheese and sauce bubble and begin to brown. This post includes Amazon affiliate links. If you buy anything via one of these links, I will receive a small commission. Thank you for your support. Great Story! Looking forward to making this recipe soon! Thanks, Mary. I’ve been thinking about ways to re-configure this blog to move it in a direction I want to go….I think I’m going to be writing more stories, so I’m glad you liked this one. I appreciate it, as it gives me the nudge to do more. kind of week. Pomegranate Pou au Feu with the family, Winter Soup de Poisson (on a cold Autumn evening)and the eggs Florentine for a light supper. My husband is especially fond of your recipes and will frequently ask “Is this a Wini recipe?” when he tastes something I’ve made that he thinks is particularly delicious (and very often the answer is “Yes”). I’ve turned my daughter on to The Bonne Femme Cookbook and she and her family love it too! Good luck and Carry On! What a great note! Thanks so much, Nancy. You’ve nudged me to make the Pomegranate Pot au Feu very soon, as the weather has finally turned chilly.